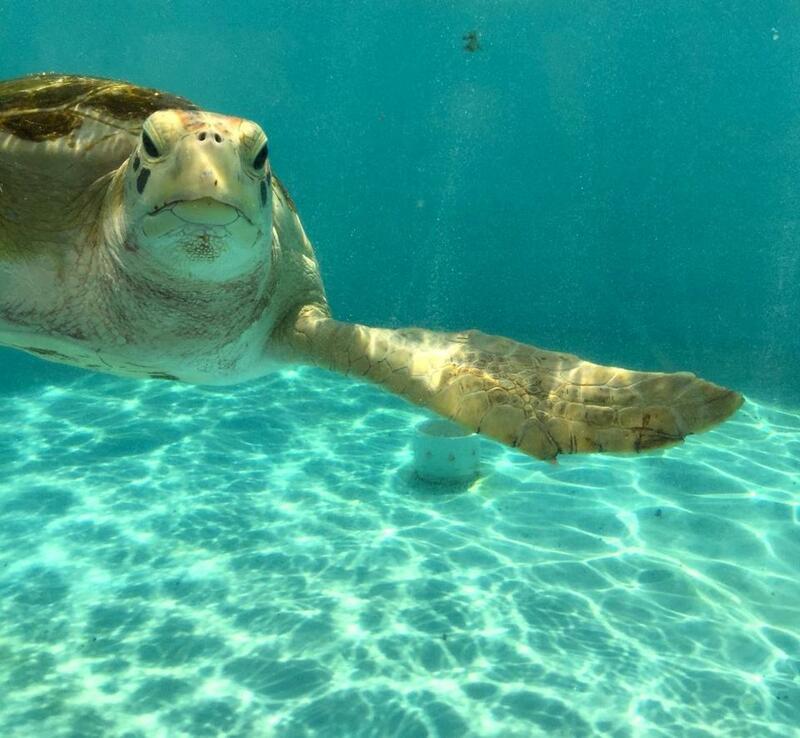 Checkers, a green sea turtle, watches visitors from his rehab tank at Loggerhead Marinelife Center in Juno Beach, Fla.
JUNO BEACH, Fla. — Last winter, five downtrodden New Englanders caused quite a splash when they landed in swanky Palm Beach County. In an area rife with celebrities, professional athletes, and millionaire tycoons, the star snowbirds were a bale of sea turtles. They were, quite literally, shell-shocked. The sudden and frequent cold snaps last winter disoriented a record number of sea turtles, who were unable to navigate Cape Cod’s hook during their migration to warmer waters. When temperatures in Cape Cod Bay dropped into the 30s, these turtles went into a hypothermic state that left them unable to surface for air. There were over 750 live strandings in the Cape Cod area last year. Five of these loggerheads were relocated in January to the Loggerhead Marinelife Center in Juno Beach, where they were treated at a state-of-the-art turtle hospital. The turtles — later named Audubon, Chowda, Codder, Mayflower, and Shertz — captured the hearts of Palm Beach County visitors, many of whom were escaping the New England winter themselves. The Loggerhead Marinelife Center is a pioneering turtle hospital, research facility, and education center, with as much drama as a normal emergency room. Some turtles have swallowed fishing hooks, others have been attacked, some are on the brink of starvation after getting stuck in drain pipes, and others have infections from eating foreign objects. After months of treatment and monitoring, the turtles are released back into the wild. In the meantime, the public can come in to view the turtles in their rehab tanks and learn their stories. Ecotourism is rising rapidly in Palm Beach County, which is full of dramatic ecosystems and wildlife preserves. The county is both bigger and more diverse than most tourists realize – in land area, it’s larger than Rhode Island. There are 38 towns (West Palm Beach being the largest), 45 miles of Atlantic shoreline, and four enormous lakes — including famous Okeechobee. In Jupiter, the nonprofit Busch Wildlife Sanctuary houses and rehabilitates Florida animals of all types. The on-site animal hospital treats around 5,000 sick, injured, or orphaned creatures annually, with the ultimate goal of releasing them back into the wild. Some require a permanent home and lifelong care, like one blind baby eagle whose mother abandoned it, or the pair of panthers rescued from a private owner who left them perilously declawed. Temporary residents of the sanctuary include crocodiles, alligators, raccoons, deer, bobcats, owls, otters, snakes, bears and a very domesticated opossum, who now lives with one of the caretakers after following him home. A day at the nearby Loxahatchee National Wildlife Refuge offers wildlife encounters of a different kind. If you canoe these Everglades, which span nearly 144,000 acres of endless waterways and lily pads with pink flowers, you’ll encounter beautiful birds and plenty of alligators sunning themselves. You’ll also spot George, Loxahatchee’s most famous resident, lurking around the fishermen. Everyone has a story about George, the 15-feet-long alligator, but rumors swirl about the mysterious, even-larger creature who bit off George’s foot during a fight years ago. MacArthur Beach State Park, on Singer Island, offers a look at the untouched subtropical coastal habitat that used to cover Florida. In addition to endless nature trails and butterfly walks, the park has two miles of pristine beaches – and plenty of sea turtle nests. Florida is the largest loggerhead turtle nesting area in the world, and northern Palm Beach County is one of the turtles’ favorite nesting spots. Turtles nest overnight, so every morning park rangers diligently record flipper tracks and rope off three-feet-deep nests full of eggs. Last year, 100,000 eggs hatched on the beach. At the start of the nesting season in May, there were already 200 loggerhead nests, 16 leatherback nests and one green turtle nest. Watching the newborn hatchlings flip and flop their way toward the ocean is a hugely popular event. Guests at beachfront resorts with turtle nests buzz with excitement every night the baby turtles are due to emerge. At MacArthur Beach State Park, rangers allow a certain number of people in to watch hatchlings each year. The Loggerhead Marinelife Center announces hatchling sightings from area beaches online, and also offers hatchling release tours from nests that were brought to them. Plenty of people reserve their spots up to a year in advance. As for the New England sea turtles, all but one have been released back into the wild. It looks like Shertz, a cold-stunned loggerhead who has gained 17 pounds since his arrival from Barnstable in January, might stay in Florida this winter with the rest of the snowbirds. Hillary Richard can be reached at hillaryrichard@outlook.com.